It all started with a piece of toast. Let’s back up a little. Actually, it all started with the book Chester’s Way, by Kevin Henkes. Chester is a mouse, who has a certain way of doing things. When Lilly comes along, she teaches Chester and his best friend Wilson new ways of doing things. Among the fun Lilly brings, she shows Chester and Wilson how to use cookie cutters to make sandwiches more interesting. After reading Chester’s Way to my Lily and Emmy, I started using a cookie cutter to make their toast more interesting. When Lily started school, I had to make a lunch for her, so I started to use heart and star cookie cutters to make her sandwiches. Emmy got the same sandwiches at home, and she requested regularly “the best peanut butter sandwich” for lunch. But now, what kind of sandwich can I make Lily for lunch tomorrow? I think she’s just going to have to be happy with plain old salami. Okay, that one is pretty cute! Making them for the kids at home isn't hard; finding a container to safely transport them to school… now that will be tricky! I have never tried sandwich cutters for making sandwiches for my kids. This is a great idea for me to work on. 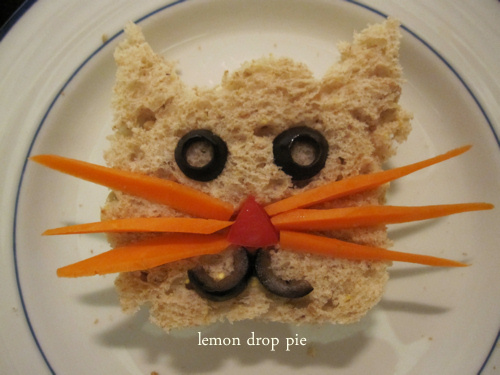 I love the cat sandwich and I can't wait to try it on my sandwich for my kids. I could go for a salami sandwich.Those are really cute sandwiches! You're such a fun mom! Maybe you can make a piggy salami sandwich for her tomorrow! You've inspired me! I have a little black olive lover, too. I'm making that kitty! Oh I love shaped food. So far I haven't branched out past simple things like hearts and pumpkins and happy faces, but I will have too!! Reading this was so much fun. You do have to be careful though not to set the bar too high for yourself! Your girls are very lucky to have such a caring and creative mom. I use to try to make those jello jigglers for my kids and the pancake shapes too. It's fun to see what a person can come up with! And any time you can tie in with a book – well that's even better. Thanks for sharing! We have that book–it's so cute! Those turned out great! I used to do fun stuff like this. I need to start again. I love how creative you get. 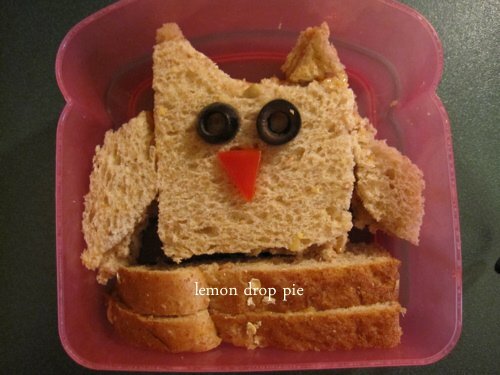 My youngest loves the cookie cutter sandwiches too but I stick to the basic shapes. A carrot coming in to contact with his cheese sandwich might just make the whole thing inedible to my picky eater.